ICYMI everyone’s talking about India right now, and in our humble travel loving opinion you should be too. Coming in top of our India bucket list, you’ll find Goa, AKA your new favourite place on earth. What it lacks in size Goa makes up for in sun, sea, and some much needed chill. Originally settled by the Portuguese, many parts of the state still ooze European charm, but with a laidback tropical twist, making it the perfect place to do as much (or as little) as you like. Once you touch down you’ll understand why hippies in the 80s were selling their Walkmans (so retro) in the markets to avoid coming home #truestory. Oh, and did we mention that the sun sets over the Arabian Ocean in Goa? Because guys, it does. So here are 7 reasons to get you Goa-ing, but trust us, there are a whole lot more. Oh darling, you don’t just deserve a holiday. You deserve the most luxe of luxe escapes from reality; the kind of getaway where we’d forgive you for losing all track of time—what day is it again? 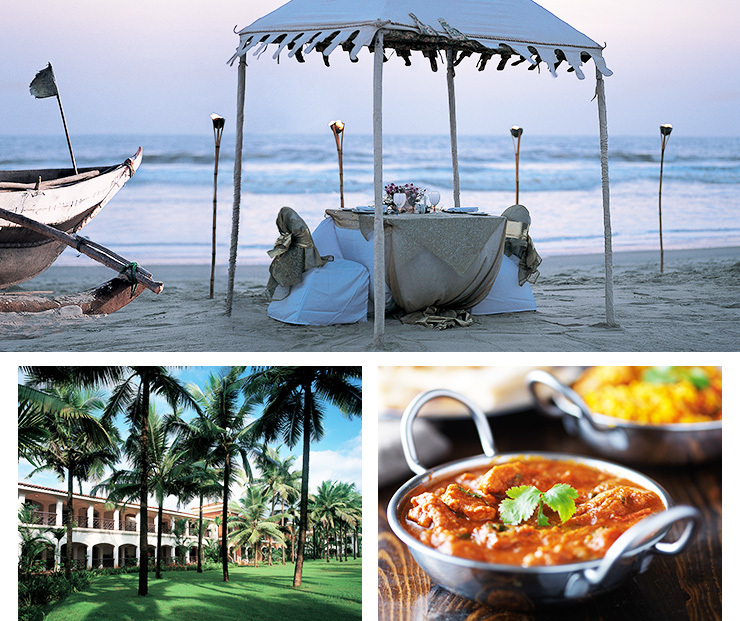 Think of Goa as India’s little resort oasis, making it the perfect opportunity to treat the hell out of yo’self. 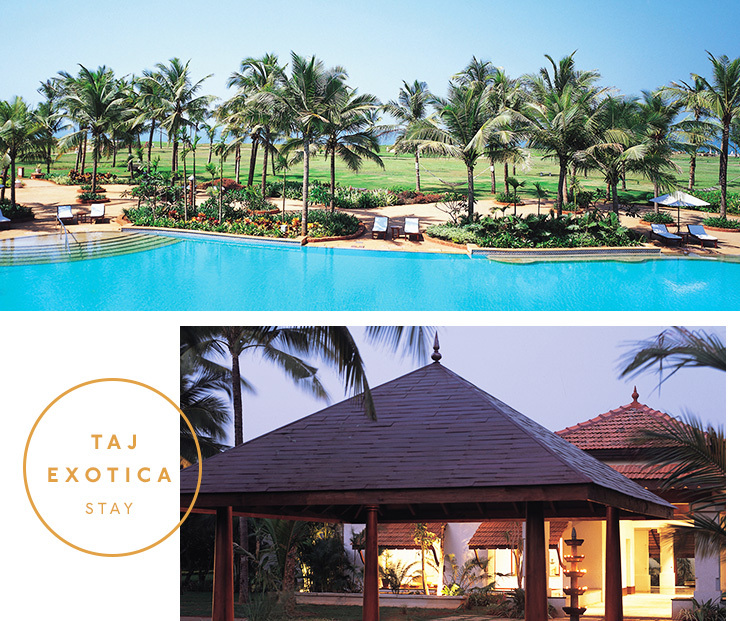 Take the likes of the Taj Exotica, a little piece of heaven nestled along the coastline in Southern Goa, with a private beach overlooking the Arabian Sea we mentioned earlier (see? We told you, luxe), complete with sprawling green lawns (56 acres if you want to get technical) and chilled AF Mediterranean vibes. Beach babes listen up! We’ve found you 101KMs of the good stuff #welcome. No matter what kind of beach you’re after, Goa has one for you and your ‘Gram. Let’s be honest, if you don’t snap your cocktail with glistening turquoise waters in the background you might as well have just stayed at home binging 13 Reasons Why. So whether you’re after Byron Bay vibes in Arambol, maximum chill factor in Benaulim, or the sheltered waters of Palolem that are perfect for a cheeky kayak (or nap), the beaches right here team are paradise found. You’ll want to check out one of Goa’s ancient towns for a mix of cultures, religions and winding back laneways. Ancient Hindu temples and Roman Catholic churches, mixed with Portuguese tiles #ihavethisthingwithfloors, provide all the necessary ingredients for a lazy day of wandering. The capital Panaji lays claim to one of the most Instaworthy spots of them all with the white washed Lady of the Immaculate Conception church, and some cute AF pastel houses scattered throughout the Latin Quarter. One of the reasons you’ll love Goa is that it’s pretty damn easy to get around. You can hire a driver for the day and get from one side to the other well before lunch, which is great because you have a tonne of exploring to do! At the top of the list (hot tip: Sada Falls and Arvalem are also worth a visit) are the Dudhsagar Falls. Literally translated to ‘sea of milk’ we like to think of these falls as a sea of fun. Before you get there you’ll need to buckle in for potentially the bumpiest jeep ride of your life (your driver can only take you so far before you’re bundled into a local’s car which is headed off road). It’s worth it though, because after a short walk you’ll arrive at 310 metres of cascading cool water, and a rock pool that’s perfect for swimming. Originating in India around 5,000 years ago, Ayurveda means ‘science of life’ and includes a whole range of things from aromatherapy, yoga, and massage, to herbal medicine. While Ayurveda medicine is practiced to assist a range of health issues, you can also enjoy an Ayurveda massage because, well, you’re worth it. If you like a side of culture with your massage this is another insight into the ancient Indian way of life. You’ll be smothered in warmed oil that’s been tailored just for you (like the MVP you are), and then massaged from your head all the way down to your toes—you’re relaxed already aren’t you? A word to the wise, do your research when it comes to Ayurveda, as with anything there can be some dodgy operators. Go somewhere reputable, like Jiva Spa, where all treatments begin with a complimentary consultation with an Ayurveda physician so you know you’re in safe hands. So in what could have potentially been a bigger buzz kill than Sydney’s lock out laws, Goa has a 10pm no-noise policy. Yes, we’re serious. But no, do not freak out. In answer to the government’s attempt at curbing noise pollution in paradise, some genius decided to beat ‘em at their own game—that’s where Goa’s legendary silent discos come in. Think sand on your feet, your newest BFFs by your side, and the waves in the distance—sounds pretty damn good to us. Travel bug biting hard? Check out El Nido in the Phillipines while you're here.